Stylistic aping is a necessary creative card for any band to play. Without knowledge of the genres of the past, how can anyone bend them, break them and redesign them? Often this leads to positive results, as with Fleet Foxes' '60s folk flirtation, and Hot Chip's '70s-'80s dance hall dalliances. Sometimes it fails, when bands try so hard to be like music's past that they create nothing new to add to the discourse. Most often that failure is the result of trying to be too exactly like that older style. This is a pothole that Sharon Jones & The Dap-Kings could have fallen into, one where their attempts at classic, quintessential soul tunes comes off as forced or needless. They don't. I Learned The Hard Way, their fourth release since 2002's Dap Dippin' with Sharon Jones and the Dap-Kings is another pure piece of ideal soul. Jones alone could carry almost any genre, with her full, emotionally honest and powerful vocals, but with the powerful horns, keys, and backing vocals provided by the incredibly talented Daptone Records house band, there is a lush, nostalgic abundance here that never feels forced. Loaded with classic arrangements that are both anthemic and thoughtful, I Learned The Hard Way is an album that suits both casual listening and audiophilic nitpicking. All the classic themes are here, mostly revolving around love, feeling like an outcast, and rejection. It's an album built on devotion, both to its classic style and to people entering and faltering in relationships. The tunes are reminiscent of The Supremes, Billie Holiday, big band jazz, dance hall R&B, and anything you could ever want from something feeling like an archival bit of lost '60s Motown perfection. 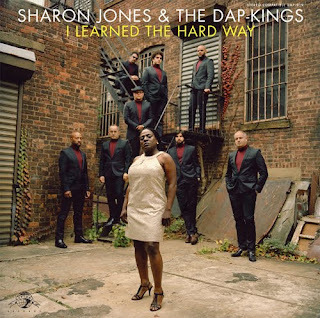 Where Amy Winehouse creates contemporary R&B centered on modern ideals, Sharon Jones makes music that speaks to the places music came from, and Jones does it better, more honestly, and every song feels like it belongs, rather than being an experimental bit designed to sell an artist. Songs like "Mama Don't Like My Man" and "Window Shopping" are just plain spectacular, and they are as timeless as they are exceptional. And, the entire album is a great. It's perfectly paced, thoughtful, fun and dynamic. There are no trap-tracks here to fight through to get to the good stuff because it's all (ALL) really good. That said, go get it. It's on sale at Starbucks shops across the country, but do yourself a favor and hit up a record store this weekend. April 17th is Record Store Day, after all. And while you're there, consider getting some of Jones' older albums too. As a little digression, since I've been on a pseudo-retro kick lately, with this and my last post about The Bird and the Bee's album of Hall and Oates covers, I have been thinking about why these old songs (and new ones that song old) are so important to me. We all love older music, there are some bands that transcend their era without fail. I've only met a couple people, ever, who didn't go through an extensive, or at least extended, Beatles phase. The same is true for Pink Floyd, Nick Drake, Big Star, CCR and so many more that I can't even begin to list. And it's not that the music is necessarily infinite or hyper-dynamic, many old Beatles tracks are simple and uninteresting musically when compared to contemporary creations. But, we love old music all the same because what it says. I feel silly boiling it down so far, but that's where I've reached. I love listening to The Bird and the Bee cover Hall and Oates because Hall and Oates wrote love songs that are pure and idealistic. They capture an era, but they also capture something inherent to all of us. "Kiss On My List" is one of the most plainly sweet songs ever (which makes it easy fodder for a cynical age) and it is about true love. We want to believe true love exists, so we latch onto songs about it, no matter how saccharine they may play out. The majority of early Beatles is about just that love. And then the later Beatles exemplifies another topic we all care for endlessly: the philosophical journey of growing up, and the idealism that powers our belief that we can change the world as individuals. Why would Pink Floyd stand the test of time when there are bands like Liars doing similar things that are more palatably orchestrated? Because Pink Floyd sang about Being and floating through existence looking for answers to big questions. CCR told us not to give up on battling against corruption. And Big Star gave us a buddy to cry with when things were bad, and was ready to cheer us back into loving and believing again. Music isn't timeless because of how it sounds (everything becomes dated in 2 or 3 years anyway), but it says things we need to hear, and it asserts things we believe in and can't always articulate. And it does so with the passion and gusto that makes it resonate. That's my little end piece. Listen to music and keep believing in things.